"Creating beautiful jewelry designs in my El Dorado Hills, California studio and teaching you to do the same." 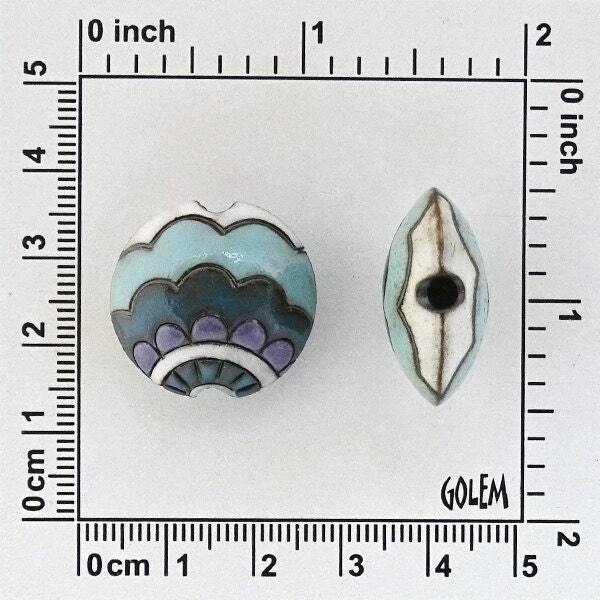 'Blue Paisley Waves' ~ are beautifully handcrafted ceramic lentil beads. Pictures show both sides of the lentil and a side view. This listing is for 1 bead. It measures 23mm in diameter, 11mm thick and has a 2.8mm hole. 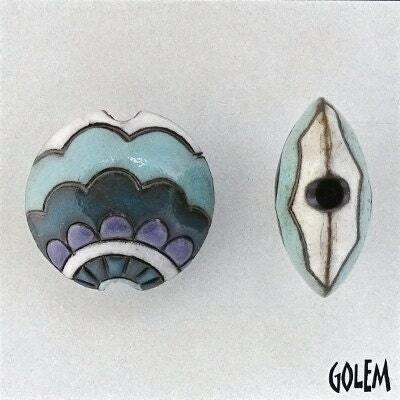 Golem Design Studio create gorgeous handcrafted/hand-carved ceramic beads in Bulgaria. If you are interested in a custom design please contact me directly at Diana@JasmineTeaDesigns.com I gladly take special requests and orders. You can choose from any beads or designs listed at my Etsy shop for a custom size or color. Don't see exactly what you want, just let me know your interests. I love to work with brides, special outfits and to complete your special look or event. I offer pearl knotting, stringing, bead embroidery and beaded kumihimo. Wow! As a child of the 60s and 70s I have a deep affection for handcrafts, particularly those involving clay, glaze, and macrame! I am currently using these in macrame jewelry and I love the results. The colors are brilliant and applied with exquisite precision making the designs easy to see and beautiful. The beads arrived safely and were packaged in a way that kept them safe from things outside the envelope, but also from each other. There were no nicks, chips, scratches or damage of any size or type in the glaze or the pottery. I highly recommend this shop with a high level of confidence in both their products and service. I will be back to shop for more.